Use this document for creating citations for web sources. It supplements what the SBL Handbook of Style says about how to cite electronic sources. It is based on a September 23, 2015 email to Dr. Jane Webster, Barton College Professor of Religion and Philosophy, from Nicole Tilford, Production Manager with SBL Press. 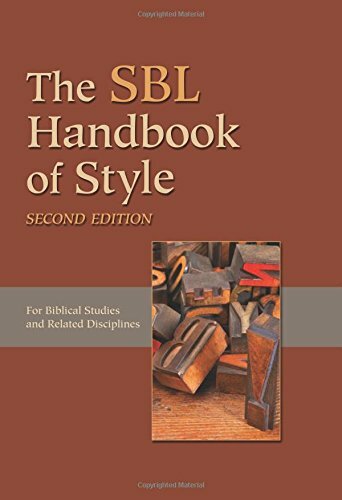 This online supplement for students in PDF format from the Society of Biblical Literature (SBL) site gives pertinent information and multiple sample entries for footnote and bibliography entries, as well as a sample paper formatted in SBL style. Unlike APA and MLA Styles, SBL style often uses footnotes rather than in-text (or "author-date") citations within the text of a paper or article. The following is taken from the Student Supplement document for SBL. For most word processing software, 10-point font is the default setting for footnotes. Footnotes in 10-point font are acceptable for most term papers, provided that the font type is consistent with the normal text of the paper. Some institutions, however, require 12-point font throughout (including footnotes). Especially for theses and dissertations, inquire with your advisor regarding the proper footnote style. Separate text and footnotes with a short rule of two inches. Insert one en space between the number and the footnote text. Separate each entry with a single space. The following samples demonstrate SBL Style formatting. But remember that your professor is the ultimate authority on how you should cite papers/assignments for his or her class (regardless of what the style manual says!). This sample paper by Dr. Jane Webster uses footnotes for the secondary sources used within the paper (with the superscript numbers in the text corresponding to the same numbers for the footnotes at the bottom of the page), and in-text or parenthetical citations for the primary sources (the biblical passages: book, chapter, and verse). In the bibliography at the end of the paper, note that the information is the same as the information in the footnotes at the bottom of the page, but it is formatted differently.